Roger Federer... raring to go for 2017 season. Roger Federer believes his six-month absence due to a knee injury could help prolong his playing career, with the 17-times grand slam winner saying he has enjoyed the break. 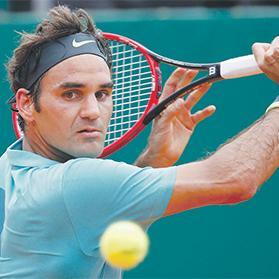 The 35-year-old Swiss had surgery on his left knee in February and, after missing the French Open with a back injury, announced in July that he needed extensive rehabilitation and would be sidelined for the rest of the season. Federer returns to action at the Hopman Cup, starting on Jan. 1, which he will play in for the first time since he teamed up with his now wife Mirka in 2002. He will partner compatriot Belinda Bencic, 19. Federer said it was a tough call to take a long break and looked at the bigger picture before deciding. “I do believe that it could be very beneficial for the future of my tennis career,” he said. “To have had this layoff, rejuvenated, refreshed... maybe mentally I needed this rest more than I thought. “Maybe my body needed a rest more than I thought it would. I tried to look at the big picture, I hope it’s going to pay off. “At least one thing I know now is I have no regrets. I did everything this year to get back in shape. It didn’t feel too gruelling, too long, too hard to go through this process.